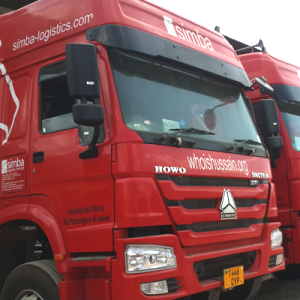 Simba Logistics Ltd was established in 2008 and boasts a total fleet size of 150 vehicles and serves the Central and Dar es Salaam Corridors. Our transport fleet includes flatbeds, drawbars, and low beds. Most of the tractor heads in the fleet are HOWO SINOTRUK 6x4 coupled with 4 Axle Simba Trailer Drawbar Units. Our main transport destinations are the Democratic Republic of Congo (DRC), Rwanda, Burundi, Zambia and Malawi. We have our head offices in Dar es Salaam, Tanzania. Safe and reliable cargo movement is vital to the growth of Africa, and that is our mission. We endeavor to provide our customers with door to door turnkey solutions that will help them focus on the development of their business. To grow into the largest multi-modal logistics company in East Africa. Simba Logistics expands its scope of services to include port clearance, stripping and warehousing services. Primary focus is to provide lifting equipment rental to gold mines in Tanzania. Simba Logistics decides to re-fleet all its used 6x2 trucks to brand new 6x4 SINOTRUK Units. Simba Lifting Services gets contracted by Mufindi Paper Mills to move a massive 80mt boiler from the Port of Dar es Salaam to Mgololo, Iringa Region. Simba Logistics introduces specialized 6x6 all terrain units for movement of cargo in the roughest road conditions. A name change is required to go with the new expanded nature of its business activities. Simba Logistics introduces a division to assist mining companies with Contractual Mining Operations involving the Load and Haul concept.